Head of the Indonesian National Disaster Management Agency (BNPB), Lt. Gen. Doni Monardo conducted a meeting with the Rector of the Bogor Agricultural Institute (IPB), Dr. Arif Satria, at Graha BNPB, Jakarta (1/21). This meeting discussed disaster management cooperation in Indonesia. In this meeting, Dr. Arif Satria said that as a research-based tertiary institution, IPB has a lot of research and innovation that can be collaborated with BNPB in disaster management programs in Indonesia. In the era of technology 4.0, the disaster mitigation program approach should be able to be carried out more smartly. 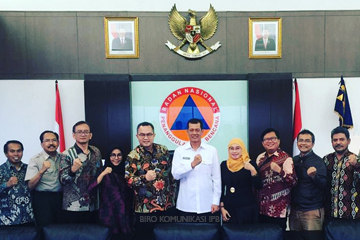 BNPB and IPB plan to collaborate comprehensively from pre-disaster, disaster events to post-disaster. For this reason, the Head of BNPB plans to prepare a new regulation in the form of operational regulations from the president. "One important point that becomes the main agenda of BNPB with universities and research institutions is to gather disaster experts who are called to become mozart or disasters intelligent. For this reason, we will discuss the stages including important competencies in cooperation with IPB. We will also conduct a preparedness program before a disaster occurs through training," said Lt. Gen. Doni accompanied by Deputy Wisnu Widjaja, Sestama and Director of Disaster Management BNPB, Dr. Raditya. Lt. Gen. Doni pointed out that in the flood control program it is necessary to provide a landslide prevention concept, as well as controlling the tsunami on the coast. "Several disasters have occurred because we have not received information and data from researchers so that mitigation efforts do not work. As a result, we can see the occurrence of disasters continues," he said. As a follow up to this collaboration, both parties agreed to immediately carry out the signing of a Memorandum of Understanding (MoU) between IPB and BNPB as well as a public lecture on disaster. This activity will be the initial series of cooperation between BNPB and IPB in disaster management efforts in the country. Present at BNPB accompanied the Rector, Deputy Rector for Cooperation and Information Systems, Prof. Dr. Dodik Ridho Nurrohmat, Head of the Institute for Research and Community Service (LPPM) IPB Dr. Aji Hermawan, Secretary of LPPM, Prof. Faiz Syuaib, Head of the IPB Center for Disaster Studies (PSB), Dr. Yonvitner, Secretary of PSB, Dr. Perdinan and Dr. Syamsul Bahri Agus and Deputy Dean of Resources, Cooperation and Development of Business Schools of IPB, Dr. Nimmi Zulbainarni.